So you mean I would manually have to run the terminal commands on each restart of the mac? It’s not that bad , only the last step (step 5) has to be repeated. The alternative is to find out how to automatically start it when Mac OS starts (e.g. by setting up a service). I know how to do it for Windows and Linux but I’m not familiar with Mac OS. Anyone around who can assist here? 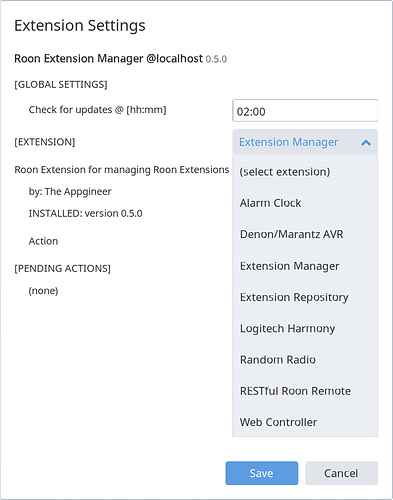 If I have extensions installed for example Logitech Harmony or Alarm Clock, does Extension Manager have to be running for those extensions to work? Yes, extensions run under the control of the manager. This gives the possibility to perform all actions from the Roon UI, including starting and stopping an extension. I am sure there is a simple solution for this, Mac is great at this kind of stuff. But I am not a terminal expert. It seems like maybe there is an extra option one can add at installation to make it auto-launch. Maybe you understand better? if auto update is enabled then the changes will be pulled in the next time an update is performed. Hi @Jan_Koudijs, would it be possible for the Alarm Clock extension to define what will be played when the alarm goes off? I’m using the Alarm Clock extension as a clock radio that plays an internet radio station to wake me up. But I have to remember to set Roon to the internet radio station at night. If I play an album and fall asleep then the the Alarm Clock extension wakes me with random music rather than with my favourite radio station. Source selection is still something I would like to add but the difficulty is that the user interface possibilities are rather limited. I experimented with Internet Radio selection and it worked quite well with the few stations that I have but how will it work when you have a lot of them? It might not be very user-friendly to scroll through a long list in a small drop-down box. So I’m still a bit in search, but surely open for suggestions. Do not hesitate to ask more details, dp. The error occurs in the Roon API part of the code, therefor I cannot directly relate it to my own code. Was it anything specific you were doing, and did it happen once or can you reproduce it? It would be very helpful if you can provide me with some steps that lead to the problem. @ben, It hits a specific log line in moo.js: MOO: reached end of buffer while parsing header, provides this a hint to you? Was it anything specific you were doing, and did it happen once or can you reproduce it? It would be very helpful if you can provide me with some steps that lead to the problem. Thank you for your message. I did not succeed in reproducing the problem. All I can add is that after installing the manager extension, I tried to play with the radio extension. I had another mistake later, that the extension had lost the core. Do not worry about that, if I have anything else I’ll tell you. Thanks again, dp. Translated from French by Google translation. One new feature is implemented: The manager and the repository can now be updated manually, previously they could only be updated via the auto update function. After upgrade to v0.5.0, it failed to start in Ubuntu so I tried in MacOS High Sierra. Roon Extension Manager started successfully! Select Settings->Extensions on your Roon Remote to manage your extensions. I’d be very grateful for some help. Thanks for the report @qdtjni. The bug with the start.js script should be fixed now. Works again, thanks a lot! But wanted to know if this first faillure is normal… and have I done anything wrong ? Sorry to hear that the wake-up call failed, I hope you had a backup. Can you tell me a bit more about your setup? On what OS do you run the Extension Manager? Do you run it manually via the start.js script or do you start it as a service at system power-up? Was it only the Alarm Clock that had disappeared from the extension list or the manager as well? The Alarm Clock extension works fine on my system. Do you have any output from the command window from which you started the Extension Manager? This would be helpful. Keep the command window open. If you run into the issue again then please upload the manager.log file and send me a link. Let’s find the cause first, after that I can help you to setup a service.